Ah, summer. Those pointless, hot and buggy several months without hockey. Thank god that’s over with. Time to put away the short-shorts, man up, and get down to the real meat and potatoes of the year. Pre-season games are already underway and memories of all those things I did to kill time so this summer would fly by are already fading. Those barbecues and lobsterbakes, kayaking, hiking, wine tastings, all the time playing in my garden (as well as, for pay, in other people’s gardens) were just a way to kick the can down the road till October 1 and the start of the regular season. 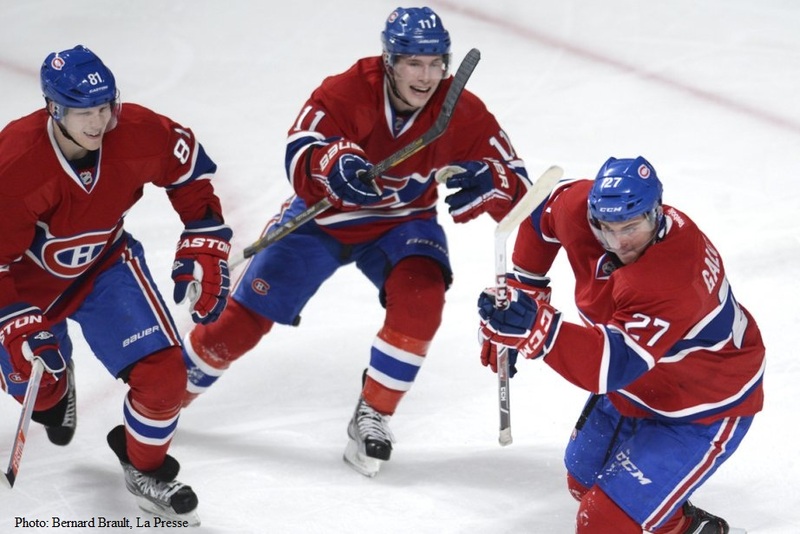 So what’s up with the Canadiens this year? Your guess is as good as mine. But I’m thinking it’s going to be a great year. Why so optimistic? Because look at last year. I mean before the flame out in the playoffs. Coach Therrien, much to my surprise, did turn the team around from last place to a 2nd place finish in the East in the regular season. With many of the same players from the previous year no less. This year’s roster looks very similar to the previous year too. 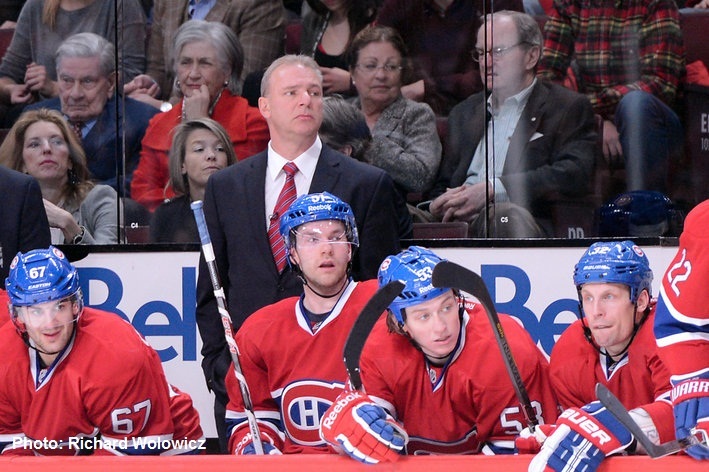 There’s a lot of skill wearing bleu-blanc-et-rouge. What I’m looking forward to is seeing how much more developed some of our hotshot youngsters have gotten over the summer – keep an eye on Gallagher, Galchenyuk, and Eller as they blossom into big boys. PK Subban, Mr. 2012-13 Norris Trophy, thank you very much, should be even more dazzling – and mature – this season. Carey Price will be back in net and, assuming his wedding over the summer didn’t sap his hockey hormones, will no doubt do right by Montreal. I’m standing by man. But I’m also glad Peter Budaj is there as a solid back up net nanny just in case. Hey, we might even get a rise out of the old farts on the team too – Markov, Gionta, and Plekanec can put a little more giddyup in their game and no one will complain. Too much. Management has also tried to address two obvious weaknesses of the team – lack of strong defence and overall decidely un-Bruinish level of thuggishness – by bringing in veterans Daniel Briere, Douglas Murray, and George “It’s always Movember” Parros. I had been hoping for a little more young star-power than these re-treads but I’ll gladly eat my words if time proves these were good additions. I’m guessing the idea was to bring in some experienced players to sync with the young stars we do have. Still, I was let down that the Habs didn’t draft a 7 foot tall Cro-Magnon man to counter Captain Chara of the Evil Empire. I’ll have to drop a little note in the GM’s suggestion box so maybe he can address that issue in next year’s draft. No doubt it will be another year of Therrien fiddling with lines till he comes up with the perfects combos. Even more likely will be a whole season of Twitterites bemoaning some of the line experiments. Que sera sera. With the largest fan base of any NHL it will be hard to please everyone. I judge by results. So are we a contender for the cup? You know, I think so. I really do. I feel it in my bones. That other tingling in my bones besides arthritis which I’m solving now thanks to this article I read Joint Pain Hack review. It’s our time to shine. It’s been, what, 20 years now. We’ve been nice and let others play with our cup. But play time is over. 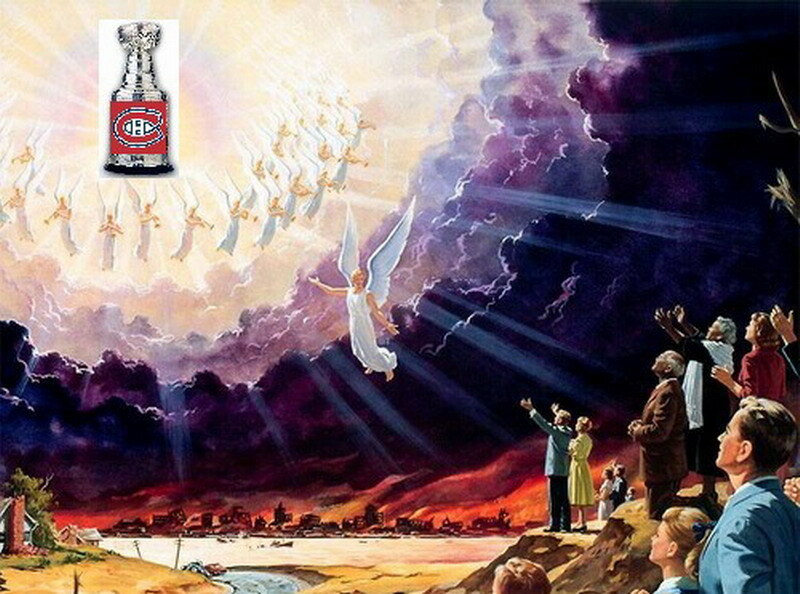 I think come June 2014 we will see the great hockey towns of North America flaming out, angels singing over the Saint Lawrence River, the billowing and glowing clouds will part and the Gods of Hockey shall deliver to the Habs faithful a tall, shiny chalice named Stanley. Hopefully it will also absolve us of our sins as it’s gonna be a long, rough season. This entry was posted in Montreal Canadiens and tagged Alex Galchenyuk, Andrei Markov, Brendan Gallagher, Brian Gionta, Captain Chara of the Evil Empire, Carey Price, Daniel Briere, Douglas Murray, George "It's always Movember" Parros, George Parros, He's a lumberjack and he's OK, Lars Eller, Michel Therrien, Montreal Canadiens, P.K. Subban, Tomas Plekanec. Bookmark the permalink.